Wishing you and your staff an excellent National Nursing Assistants Week , June 15-22, 2017 ! Nursing assistants, like all direct caregivers, are arguably the most important members of care teams. They add life and sparkle to our loved one’s day. They bring smooth days and special touches because they know our routines and how to do things “just so." And, they are often the first to notice an “off” day, a patch of red skin, or a new symptom. Our caregivers put their hearts into their work. With jobs that are both physically and emotionally demanding, it is not surprising they often have the highest turnover of any of our staff. To be the best they can be, our caregivers need to be empowered and appreciated. We need to be accountable to them when they offer observations.Scheduling for consistent assignment maximizes their relationships and their autonomy to personalize care. Everyone benefits when we create a culture that supports our caregivers, fosters long tenure, and nourishes community. There are specific strategies to do all this. And like every other project we undertake, we need to decide how we’re going to know if our changes are working, and track those indicators. 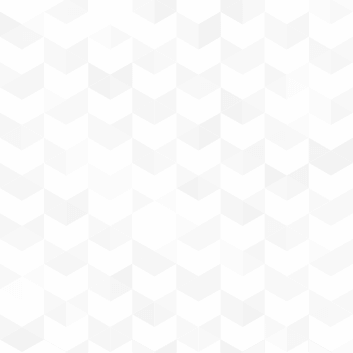 Read on for an introduction to some of our favorite resources and to learn about our enhanced Staff Stability Tracking Tool – hot off the press! Last month our feature article reviewed the Consistent Assignment goal, with links to our full package of resources that includes the nitty-gritty of how to make it happen. This fun video introduces the topic of staff stability and the value of using data to see if the changes you make are getting the results you want. 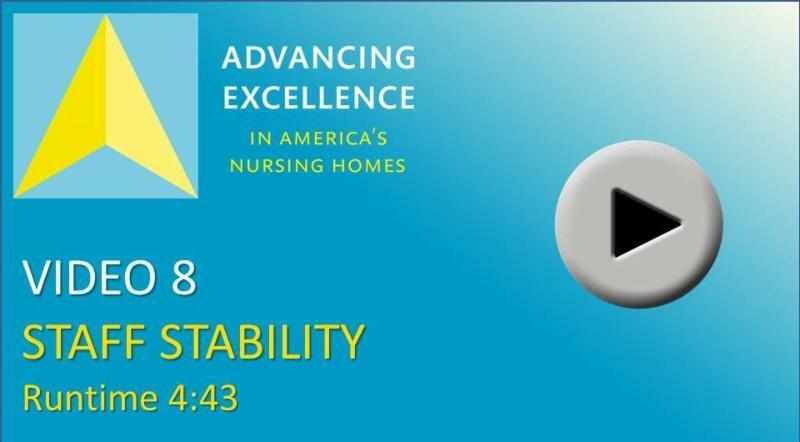 Remember, the NNHQI Campaign was formerly known as the Advancing Excellence in America’s Nursing Homes Campaign. Staff stability is foundational to creating and sustaining a culture of continuous quality improvement – but increasing staff stability is likely to require a quality improvement project of its own. 1. 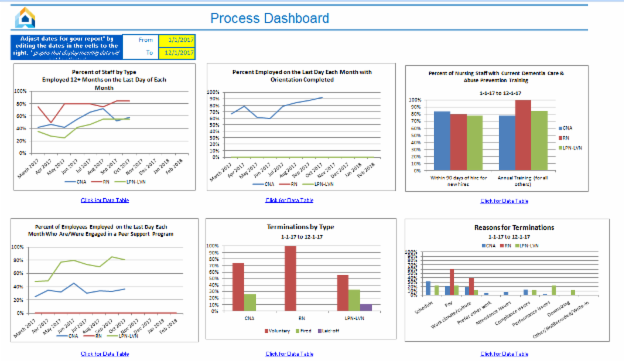 Identify your baseline with our NEW Staff Stability Tracking Tool that calculates both turnover and retention rates, has an in-tool dashboard (see below) for monitoring on-boarding and termination processes, tracks Staff Satisfaction Survey action plan, and has a cost of replacement calculator. Too much? Pick and choose what you want. There are plenty of options to get started. 2. 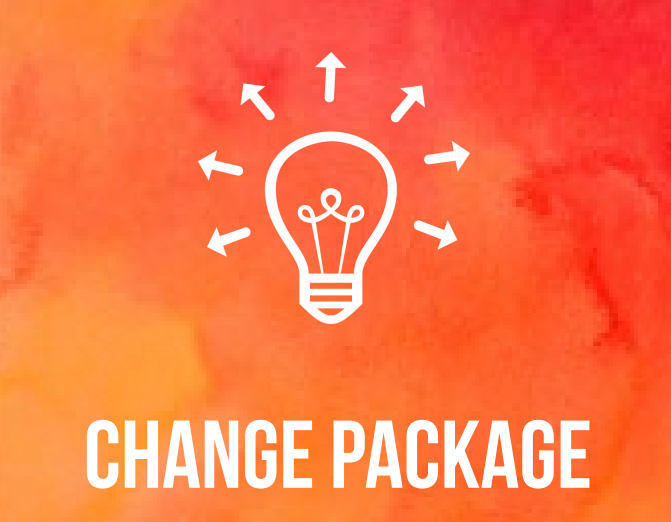 Create Change Start your brainstorming with the NNHQCC’s Change Package (see next article) and Process Questions from the Campaign. Then, check out a selection of evidence-based and model-practice resources for increasing staff satisfaction and improving staff retention on our Staff Stability Create Change page. We have resources for optimizing staff recruitment and creating a culture of retention, implementing a great orientation program, empowering staff, and measuring staff satisfaction. 3. Engage Your Community Don’t underestimate the power of sharing your goal, progress, and both your challenges and successes along the way. Welcome input and feedback at every stage. Teamwork makes the dream work! Fact sheets and story board tips are posted here. Charts from your dashboard (above) and progress trends (below) are perfect for this. 4. 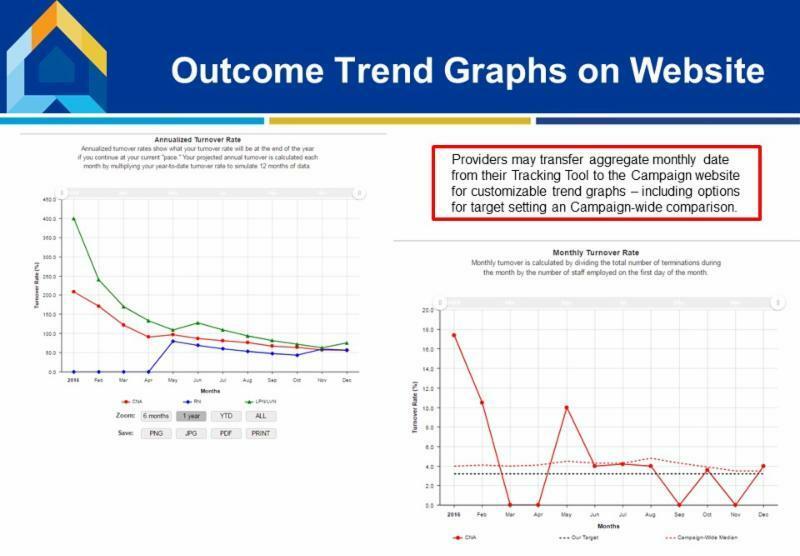 Monitor and Sustain Long term care providers may transfer aggregate monthly outcomes to their Campaign website account to access progress reports (see below). 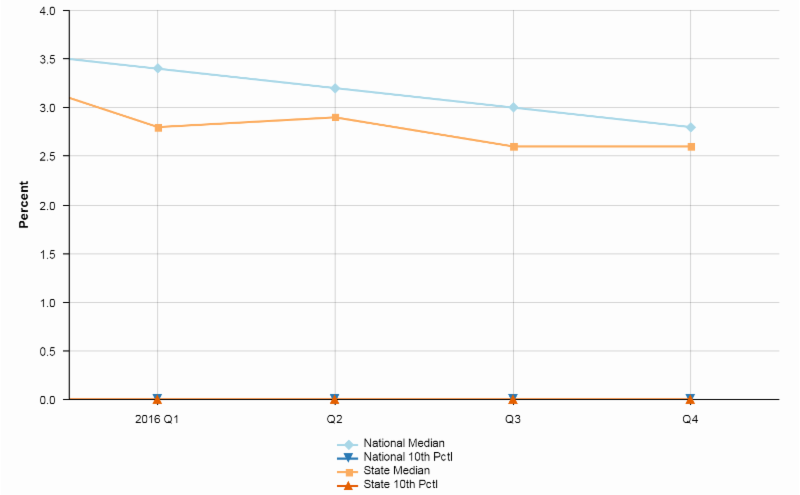 These trend graphs are available for both retention and turnover rates, and users may set and display a target line and/or Campaign-wide comparative data. 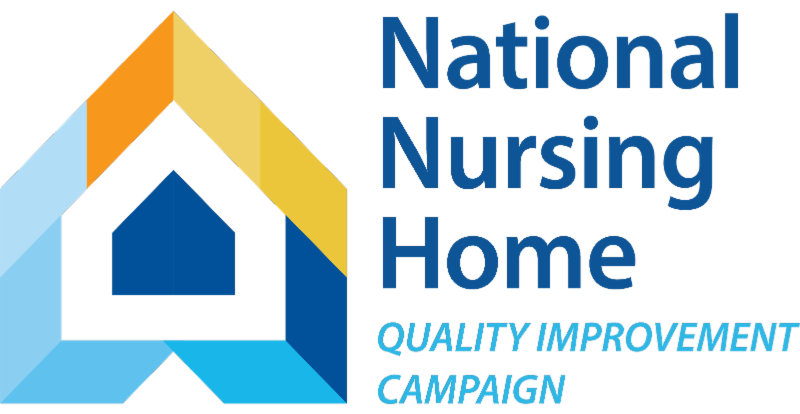 Gleaned from site visits with ten high performing nursing homes across the country, The National Nursing Home Quality Care Collaborative’s Change Package offers seven strategies for improvement. Paired with evidence-based tools and resources, these strategies are a recipe for success. Strategy #2 fits right in with our focus on staff appreciation this month. Welcome new staff - make them part of the team. Set high expectations - support success. When implemented correctly, this simple tool can do a world of good. Its use recognizes the value of all staff in the care of residents. 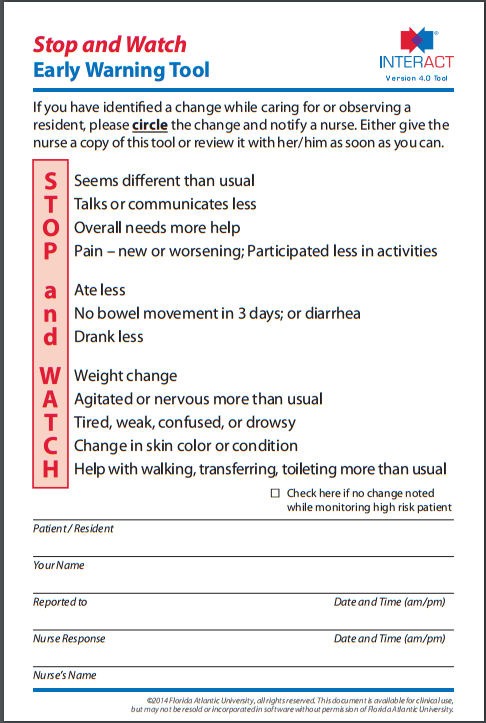 It empowers staff to speak up, and creates an accountability loop that closes with a nurse reporting back to the staff member regarding the follow-up and outcome of their observation. What better way to appreciate our front line staff than on-the-spot evidence that they make a difference? Print on pocket-pads so they’re always handy. Trend graphs for each of the CMS Long Stay and Short Stay MDS 3.0 measures have been updated through Q4-2016. Next update is expected in early August.